This is a very YMMV offer. IF you are physically near a Fry’s brick and mortar store, they are running a new type of a promotion so far this week. Twice a day, upon opening and at 5:30pm local time, the first 25 customers in line that mention the daily magic word (which can be found in their daily mailing list emails of course) get a coupon that is worth 20% off purchases of $299+ at the B&M store. Some products from some brands are excluded (Nikon, Sony, Samsung, Bose, LG, Tempurapedia) and of course gift cards are excluded. The maximum discount with the coupon is $1000, in other words, up to a $5000 purchase. If your purchase is over $5000 in eligible products, then you get a flat $1000 off discount. PS: this post is also a traffic alert if your driving involves areas surrounding Fry’s B&M stores. Granted, it won’t be like Black Friday madness ~ probably. Harbor Freight has coupons in many places these days, including printed glossy magazines. This coupon I spotted in the Valpak envelope coupons that come with the weekly grocery ads in the mailbox. The coupon gets you a FREE 24-pack of single use batteries, AA or AAA, your choice. You can walk into their store and get these for free after coupon. Not sure if you have to pay sales tax. Coupon expires 3/1/18. This is brick and mortar store promotion only! It does NOT apply to online sales! 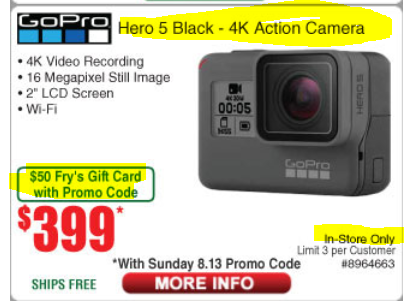 The Weekly Fry’s coupon for their email subscribers (free to join), running from Sunday until Saturday 8/19/17 PM, including an offer that gets you a $50 Fry’s Gift Card with the purchase of the GOPRO HERO5 Black action camera going for its regular price of $399. The offer is only available at their Brick and Mortar stores. Limit three per customer. Speaking of Price Club / Costco (for those not old enough to remember 1993, they merged in 1993), they are among the retailers that are participating in Google Express, along with Fry’s, Tarjay, Staples, etc. For first time Google Express customers, Groupon has a Pay $15, Get $40 to spend thru Google Express promotion. That is a pretty good discount, especially if you can keep your order close to the minimum. Limit one for you and another one as a gift. The offer is for new Google Express users. I haven’t made a Google Express purchase yet, but I believe tipping for the delivery is expected? This may sound a bit counter-intuitive if you hadn’t heard of it before, but Amazon has a new feature where you walk into a brick and mortar chain store, you hand them cold hard cash, and said cold hard cash magically appears as a balance in your Amazon.com account. You pay no fees for this service (take that PayPal!). To encourage people to use this relatively new Amazon Cash service, Amazon has launched a new promotion. If you load $20+ before 7/31/17, you will receive (later via email) a $10 Amazon promotional store credit to spend in the future. So if you load exactly $20, it’s like getting 50% more. The $10 promotional store credit must be spent by 8/31/17. The $20+ balance is a gift card balance, it never expires. A barcode is generated that is a link to your Amazon account. You show that barcode at the B&M store when you load your cold hard cash. The bar code can be generated with a web browser or using the Amazon app. Details on how to generate and save it at the linked pages. You can even print it. A number of chain stores are participating in this promotion, including GameStop, CVS, Fred’s, Speedway, KwikTrip, and more. 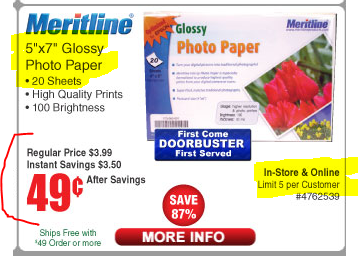 Fry’s Electronics have an online and in-store doorbuster, you can get a 20pk of 5×7-inch photo paper (Meritline brand, glossy, model 175-064) for $0.49. That’s 2.5-cents per sheet. Limit five 20-packs per customer. Offer ends 4/7/17 or earlier if sold out. Inventory varies by store. Store pickup is also an option, along with online shipment and in-person delivery. YMMV based on location and availability. NOTE: this is NOT a Promo Code offer. Anyone can buy it without signing up for their e-mail list. For the week of March 13-19 (2016), members of the Plenti Rewards program (Rite Aid and others, operated by American Express), can get 800 Plenti points ($8 future buying power) when you purchase a $50 eBay Gift Card at Rite Aid. Limit two per customer during this week. That’s 16% back in rewards. This offer will be available at Rite Aid B&M stores. I do not know if it will be available at the Rite Aid website as well. 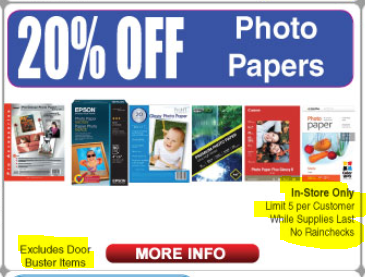 + the items mentioned above in this blog-post (not their linked weekly ad) are limit one per customer, with the offers good in-store or at their website – unless otherwise indicated above – it makes it easier to read and write since most of them are “limit 1” in-store or online. Don’t look now, but Black Friday 2016 is less than 51 weeks away already. Just around the corner 🙂 And with that, we have a new shopping week, which brings us a new round of weekly promo code offers for Fry’s email newsletter subscribers (free to join their email list). Some of the offers are online-only, others are in-store-only, others are both. 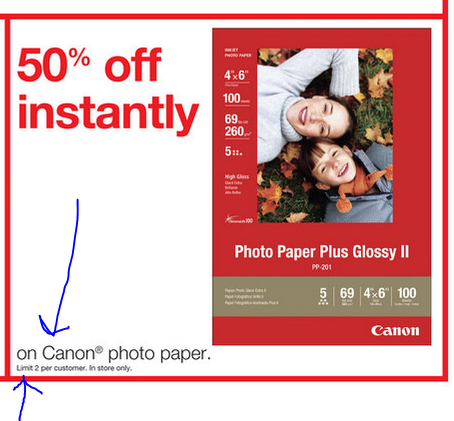 This is marked next to each offer in their weekly ad that covers the Dec 6-12 (2015) period. In these posts, the default for an item is to be offered in-store and online. If not, I mention it next to each item’s name, eg the mystery Canon Elph right below. At Fry’s brick and mortar stores, on Wednesday 11/25/15, using your personal promo code from the Fry’s email newsletters, you can get one 70-inch Sunpak Ultra Tripod/Monopod creature for $30. This is model Ultra 7000TM… Some call these hybrid creatures “Tri-Monopods”. For the early season shoppers, Best Buy is planning to have a brick and mortar sale-a-bration on Saturday November 7 (2015) between 1-5pm local time at their stores. Some of the offers are teased on their website and include a $30 Best Buy Gift Card with the purchase of a Sony a5100 or a5000 kit, and a $40 Best Buy Gift card with the purchase of a GoPro Hero4 Session or Hero+ LCD action camera. The first 100 customers per store will receive an unspecified “free tech gift”. You can find out which ones of your local stores are participating by using the blue location box over there.